While these numbers are certainly suggestive, we should be cautious about interpreting the survey results as representative of the views of county residents. Opponents of the tax increase have promoted the poll through social media and email. Hence the group of 630 respondants is far from being a random sample of voters; it is a self-selected group that may not accurately represent the opinions of voters in Prince Goerge’s County. To take the online poll, go here. 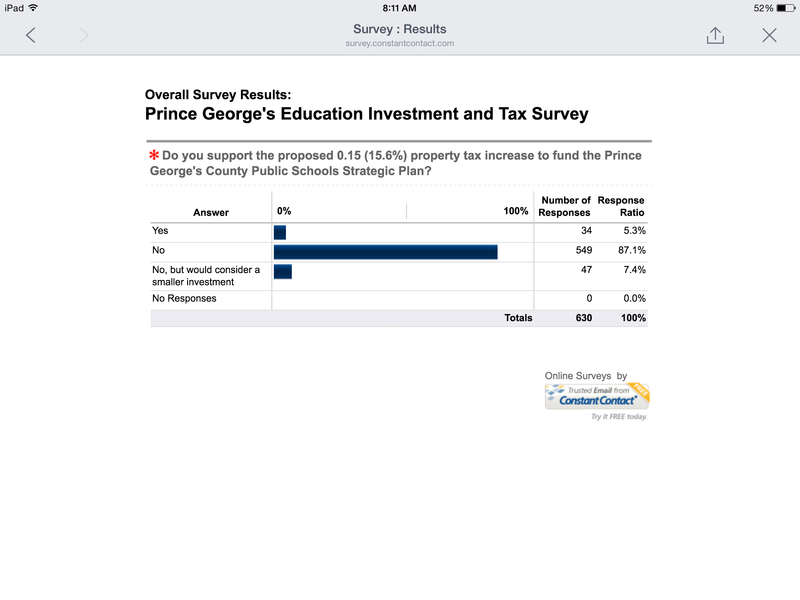 To read about how the additional funds would be spent according to PGPS’s strategic plan, see this previous post. See the calendar for information about this evening’s Community Advisory Meeting with Mel Franklin. This is interesting, although I’m not surprised at the results. While I’m still undecided on this issue, I’m not sure tax payers always vote in their own best interests when it comes to increasing taxes. One thing to note is there is no way to tell from the survey whether or not someone actually resides in PG county.